Pkgmgr can take a list of windows features to install on the command line or take an xml file name as a parameter for unattend installs. This article will illustrate the use of pkgmgr unattend files for installing optional features. Make sure you have installed one of the supported editions of Windows Vista/Windows Server 2008 before proceeding. Make sure you have administrative privileges on the machine: By default, you do not have them if you are logged on as a user other than the built-in Administrator account, even if this user was added to the local Administrators group on the machine (this is a new security feature in Windows Server 2008, called LUA, which is beyond the scope of this article). Make sure to either log-on as the built-in Administrator account, or explicitly invoke applications as the built-in Administrator, as needed, using the "runas" cmd-line tool. For example, to launch notepad.exe, run this command: "runas /user:administrator notepad.exe". You are prompted for the password of the Administrator account. It is useful to have a cmd-box shell that is already elevated, by running "runas /user:administrator cmd.exe". Every application you run from that cmd-box is elevated as well, and you do not need to use the "runas" syntax from that cmd-box. This specifies updates to install by update name and takes a semicolon separated name of updates to install. This specifies file name of the unattend XML file. If you run pkgmgr without the "start /w" prefix, the pkgmgr cmd will return immediately and you will not know when the optional feature install has completed. Follow the instructions in the Prerequisites section above for starting a command window running as the local Administrator account. From the command window, run notepad.exe. 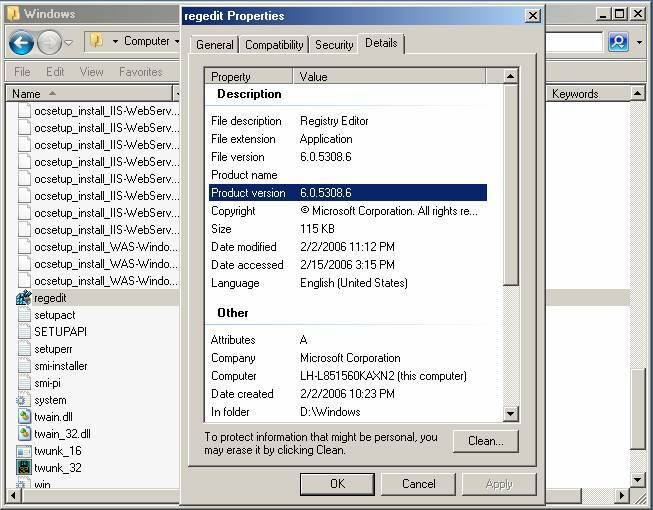 To install only the IIS 7.0 default features, copy the following unattend.xml text into notepad. If you want to install all IIS 7.0 features for evaluation purposes, use one of the following unattend.xml files. For Windows Vista Professional, Windows Vista Ultimate, or Windows Server 2008 Editions, copy and paste the following text into notepad. From the Start Menu, click Run and go into the explorer. In the Properties dialog box, select the Details tab and note the Product Version. In your notepad, enter this value in the XML attribute version to match the build you have installed. Possible values are: x86, amd64, and ia64. Save the notepad file with name "unattend.xml"
Note: If you saved unattend.xml to a drive folder other then the current drive and folder of your command window, you must specify the full path of the unattend.xml file in your pkgmgr /n: parameter. IIS 7.0 setup via pkgmgr.exe should take 1 to 5 minutes. When the command prompt returns, IIS 7.0 setup is complete. A result of 0 indicates success. In this article, we examined how to use pckmgr.exe to install the Operating System and IIS 7.0.